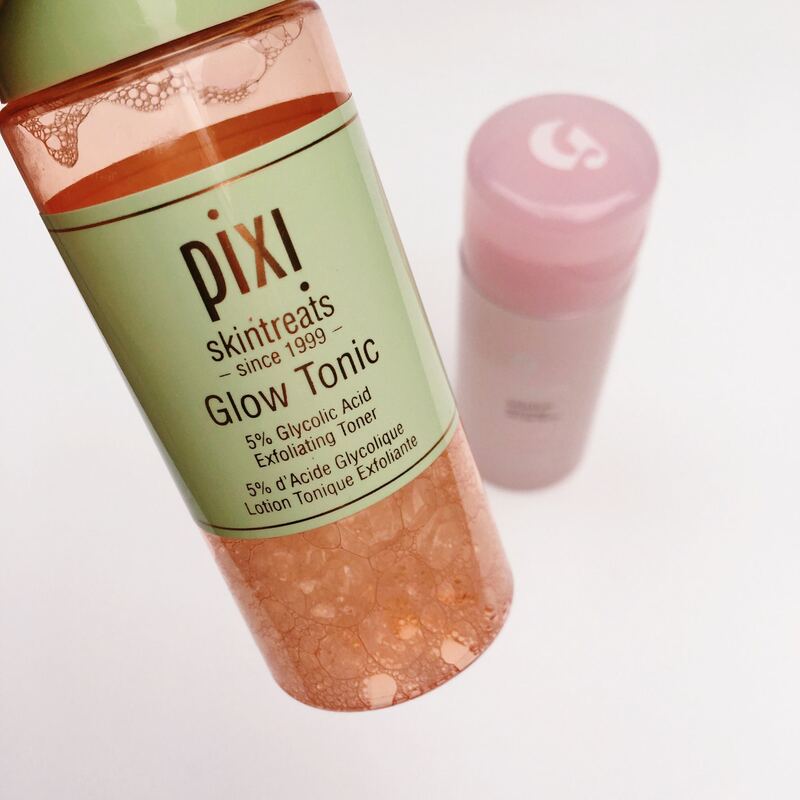 Pixi Glow Tonic is a skincare product with a beauty cult following, much like most of Glossier’s products (guilty). Liquid chemical exfoliants help remove dead skin cells from the surface without harsh physical irritants. Most people don’t know that they are using their scrubs incorrectly, so chemical exfoliants are a great alternative. When using a scrub, you should let the product do most of the work and you should just move it around your face. When people scrub too hard with exfoliators, it can actually irritate your skin, causing sensitivity and breakouts. While chemical exfoliants may sound scary, they can actually be a much more gentle way to exfoliate. 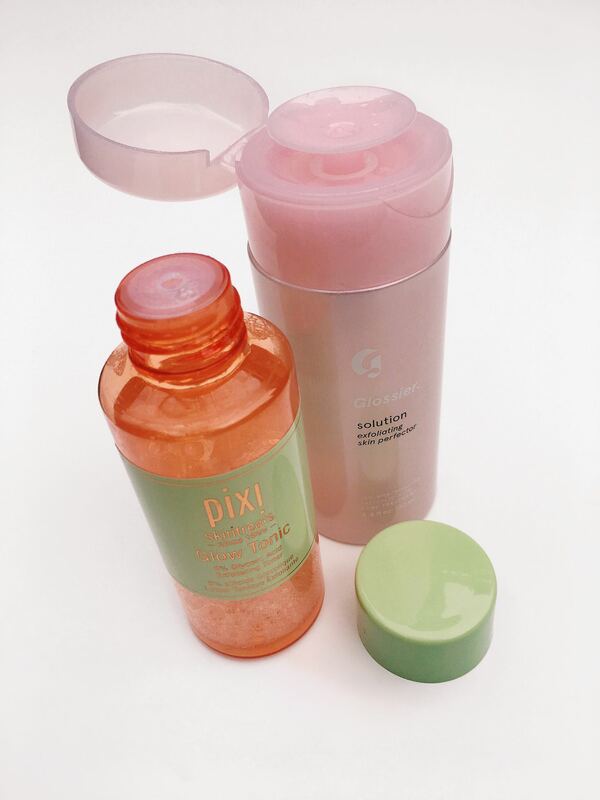 So, Pixi Glow Tonic vs. Glossier Solution–which is better? I’ll compare the two side by side and share my thoughts on which one I’ll be repurchasing when they run out! 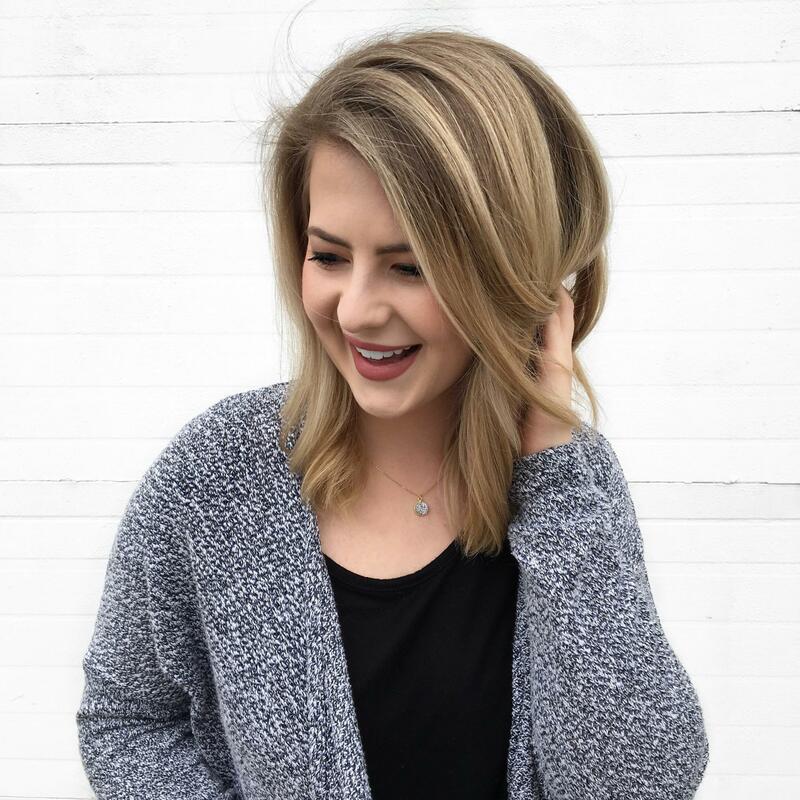 Remember, if you are using any prescription skincare, consult your dermatologist before introducing a chemical exfoliant to make sure that none of the ingredients will have a negative reaction. Packaging: This packaging has a screw-off lid and you pour the solution onto a cotton pad. You almost have to shake the liquid out of the opening, so you aren’t wasting any extra product. I use about 3 “shakes” of product on my cotton round per use. Strength: Glow Tonic really gets every last bit of oil off of my face, but not in a way that leaves my skin feeling dry. My pores feel tighter but my skin never gets uncomfortable if I wait a few minutes before applying my moisturizer. Glow Tonic does not make my skin red and I feel comfortable using it in the mornings. Full list: [Active Ingredient]: Salicylic Acid 0.5% [Inactive Ingredient(s)]: Aqua/Water/Eau, Sodium Hydroxide, Lactic Acid, Glycolic Acid, Gluconolactone, Propanediol, Ethoxydiglycol, Magnesium Chloride, Glycereth-7 Trimethyl Ether, Niacinamide, Betaine, Inositol, Citric Acid, Glycerin, Phytic Acid, Pentylene Glycol, PEG-60 Hydrogenated Castor Oil, Caprylyl Glycol, Ethylhexylglycerin, Parfum/Fragrance, PEG-8, Aloe Barbadensis Leaf Juice, Acetic Acid, Potassium Hydroxide. 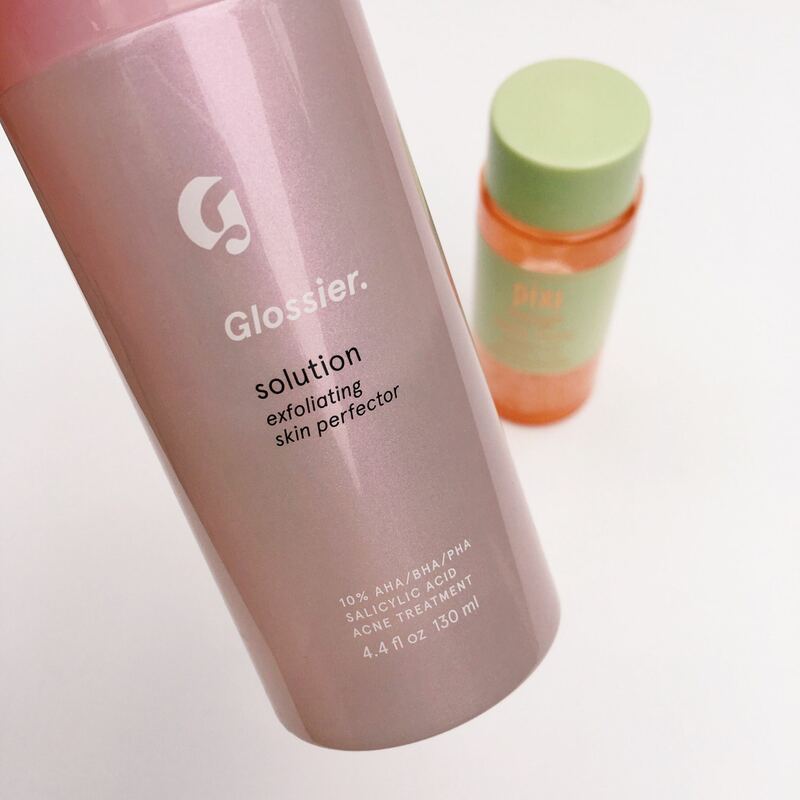 *For Transparency: There’s been a lot of online debate about the ingredients in Glossier’s Solution. You can read about the difference between active and inactive ingredients here, a rave review of Solution here and a critical review here. Packaging: I love this easy press and pump packaging. While snap lids with liquids are normally scary, this one shuts very nicely so I’d feel fine traveling with this in my bag. I use two pumps of product on my cotton round per use. Strength: Salicylic Acid tends to dry my skin out a little so only use solution every other day. It has never caused any peeling or breakouts. It can make my skin slightly red on occasion so I tend to use Solution at night. Neither of these products every broke me out, so that’s a big win right there. I definitely notice a difference when I am using one of these two exfoliants versus none at all. In the end, I will probably repurchase Pixi, only because I don’t really notice the effects of Salicylic Acid on my skin. However, if you are a Salicylic Acid person, then I highly recommend Solution. I’ll probably pick it up again in the future but for now, I’m going to stick to Pixi. If you have any other questions or want to do some Glossier shopping, you can shop through my rep page here.